A Uighur Muslim woman claims she was tortured and abused at a Chinese internment camp where hundreds of thousands of religious minorities are being kept, according to the Independent. 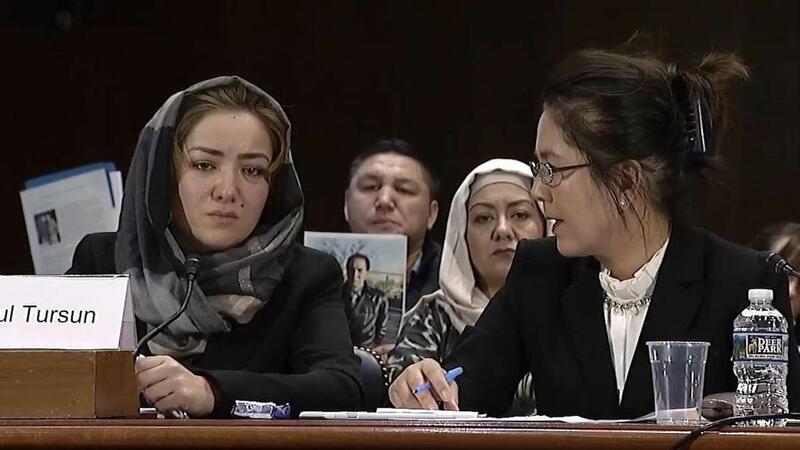 29-year-old Mihrigul Tursun told reporters during a Washington press conference that she was subjected to a degrading four-day interrogation which included no sleep, having her head shaved, electrocution and "an intrusive medical examination," after her second arrest in China in 2017. Tursun claims that the abuse got worse when she was arrested a third time. "I thought that I would rather die than go through this torture and begged them to kill me," Tursun told journalists at a National Press Club meeting. China has come under fire in recent months over their treatment of Muslims known as Uighurs - of which as many as two million have been incarcerated in "reeducation camps" in the country's far west to reprogram them for what the government has called "ethnic unity." Chinese authorities routinely deny any ethnic or religious repression in Xinjiang. They say strict security measures – likened by critics to near martial law conditions, with police checkpoints, the detention centers, and mass DNA collection – are needed to combat the influence of extremist groups. Raised in China, Tursun moved to Egypt to study English at a university where she met her husband. Together they had triplets. In 2015, she traveled back to China to visit family and was immediately detained and separated from her infant children. After her release three months later, Tursun found that one of her children had died and the other two had health issues. She claims the children had been operated on. Tursun was arrested around two years later for a second time - while several months later she was detained for a third time where she spent three months in a cramped prison cell along with around 60 other women. The group had to take turns sleeping, and toilets were situated in front of security cameras. She says that the women were forced to sing propaganda songs praising China's Communist Party. Ms Tursun said she and other inmates were forced to take unknown medication, including pills that made them faint, and a white liquid that caused bleeding in some women and loss of menstruation in others. She said nine women from her cell died during her three months there. One day, Ms Tursun recalled, she was led into a room and placed in a high chair, and her legs and arms were locked in place. “The authorities put a helmet-like thing on my head, and each time I was electrocuted, my whole body would shake violently and I would feel the pain in my veins,” she said in a statement read by a translator. She was later released in order to take her children to Egypt, but says that she was ordered to return to China. Instead, she phoned US authorities from Cairo and was allowed to settle in Virginia in September. Tursun joined over 270 scholars from 26 countries last week in a published statement condemning China's "mass human rights abuses and deliberate attacks on indigenous cultures." China has hit back against the criticism, stating last month that 15 foreign ambassadors who wrote a letter expressing their concerns over the incarcerations "should not interfere in the internal affairs of other countries." Meanwhile, reports have emerged that over half a million Han Chinese citizens have moved into the homes of Highur Muslim families in order to report on whether they "display Islamic or unpatriotic beliefs," according to the Independent. The informants, who describe themselves as “relatives” of the families they are staying with, are said to have received specific instructions on how to get them to let their guard down, including offering them cigarettes and alcohol. Beijing added that it's simply trying to bring Muslims into the "modern, civilized" world. In September, the Trump administration weighed sanctions against Chinese senior officials and companies in order to punish Beijing's detention of ethnic Uighurs and other minority Muslims. Beijing, in response, said it would retaliate "in proportion" if Washington levies the sanctions. China's ambassador to the United States, Cui Tiankai, said late last month that while the United States was using missiles and drones to kill terrorists, "we are trying to re-educate most of them, trying to turn them into normal persons (who) can go back to normal life." "Can you imagine (if) some American officials in charge of the fight against ISIS would be sanctioned?," Cui said - adding that "if such actions are taken, we have to retaliate."